Dr. Kaur received a Bachelor in Physiotherapy from Lyallpur Khalsa College in India in 2004. She worked as a physical therapist in an outpatient private practice from 2006 to 2008 in Michigan. She then worked in a hospital-based outpatient facility from 2009 to 2013. Her case load all these years was mainly orthopedic and sports rehabilitation. Dr. Kaur completed her DPT from Rocky Mountain University of Health Professions in Provo, Utah. While working full-time, she earned her PhD in Orthopedics and Sport Science in 2013 at Rocky Mountain University of Health Professions. Her dissertation focused on developing new and effective exercises for shoulder rehabilitation. After finishing her PhD in 2013, Dr. Kaur accepted an assistant professor position at the Austin campus and started teaching full-time in January 2014. In fall 2013 she completed Manual Therapy Certification (MTC). 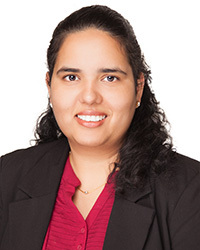 Dr. Kaur is part of the orthopedic faculty, and her teaching responsibilities include Musculoskeletal I: Orthopedics, Musculoskeletal III: Advanced Extremity Examination, Evaluation, and Manipulation, and Evidence Informed Practice II.